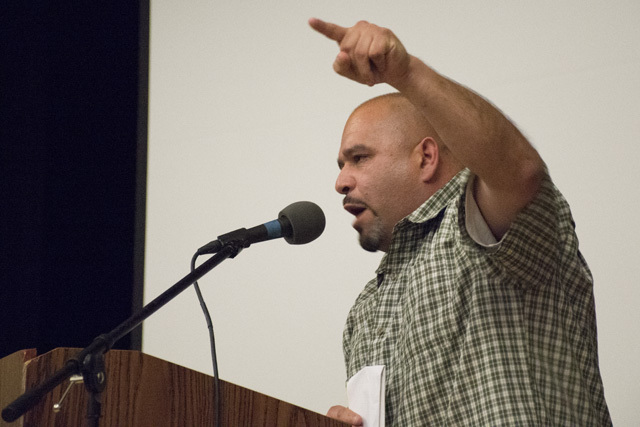 Oscar Salinas speaks at rally in April 2016. Activists who have been pushing for police reform from the Mission District said Tuesday they are waiting for the newly appointed police chief William Scott to prove himself. Scott, a 25-year veteran of the Los Angeles Police Department, spearheaded reform efforts in the LAPD, according to the Chronicle. That, however, was not enough to win over local activists just yet – they want to see action. Mayor Ed Lee appointed Scott Tuesday – surprise for many who expected interim Chief Toney Chaplin to take the seat. “I’m very skeptical,” said Adriana Camarena, a writer and activist who has been pushing for use of force reform in the department and advocating for the families of several men shot by officers, including the homeless Mayan immigrant Luis Gongora Pat. Camarena also suggested that the chief could demonstrate his intention to make serious changes by initiating a task force on reform that includes members of the Board of Supervisors, the District Attorney, the Public Defender, the Office of Citizen Complaints – and activists. Bac Sierra said he would like to see Scott recommend that Officer Roger Morse be fired. Morse is one of the officers involved in Nieto’s shooting and now embroiled in an Office of Citizen Complaints case that emerged after he made some Facebook comments about Nieto. Father Richard Smith of the Church of St. John on 15th Street, who has been leading weekly silent vigils protesting the killing of 21-year-old Amilcar Perez Lopez by police in February of last year, said he hopes for honesty from the new chief. Smith and other activists advocating for criminal charges to be brought against the officers involved in shootings have already had conflicts with the interim chief over the removal of Perez Lopez’ body from the crime scene before the arrival of District Attorney investigators. Although anxious to see, activists said Scott’s appointment has a few upsides. For one, Scott has committed to live in San Francisco, a requirement that the Board of Supervisors recently adopted a non-binding resolution to require. Chaplin does not live in the city. Bac Sierra, on the other hand, was unmoved by that commitment. More convincing is Scott’s outsider status. Bac Sierra, Camarena, and Smith agreed. “For him to come from outside this entrenched corrupt department, I do think that can be a positive step forward, but it is simply not guaranteed,” Bac Sierra said. Camarena, however, pointed out that it might be an obstacle for the new chief. This is truly a slap in the face for progressives and liberals. We need law enforcement to reflect the people. This would have been a great opportunity for Ed Lee to appoint an illegal immigrant as police chief. They understand what people are going through. Need Latin illegal police Chief or proof racism still exist. Dump Trump. Thank you Ricardo, you capacity for thought fullness is always impressive, as is your ability to take the conversation to a different level is notable. I respect your opinion even though it’s wrong. Clearly you vision is clouded by white privledge so much you can’t see it.open your eyes and dump trump. Ricardo Ruiz, you have got to be kidding! Illegal aliens are already an overly protected class of people who have been coddled beyond belief and handed every freebie imaginable, at the taxpayer’s expense. They are very much overrepresented, particularly in SF, to the detriment of every other group, particularly the African American community. When people like Canamera and Bac Sierra (whoever he is) immediately react with such bold statements as this one from Camerana, “token moves for me will not be sufficient. If he wants to release from duty all of the officers involved in police shootings, that would be an important first step.” And this from Bac Sierra, “Living in San Francisco does not matter. It’s a changed place, so living here does not matter that much to me.” The issue of the police chief living in SF was obviously significant to the majority of those in charge but to Sierra it’s not a concern because both he and Camarena are entirely focused on their own group of people, as though they are the only ones who matter. They are profoundly arrogant and thumbing their noses at the rest of us. It’s clear that they’ve already become incredibly emboldened by the excessive amount of power they have somehow amassed in SF and apparently have no shame continuing to demand more. How dare they!! You obviously have been raised with white privilege. Have compassion in your heart for others and open your wallet. We need to transfer money from white privledged to illegal Mexicans. We need to level the playing field and hit the reset button. Need 40% federal tax and 40% state tax. We run California so we can make it happen. Viva la rasa. Dump Trump. You run CA alright, right into the ground. How about cleaning up and policing your own neighborhood, turning in gang members, that kind of thing? How about giving back? How is it that you contribute to the greater good and not just in your own community, but generally? What have you done for SF and San Franciscans who are not a part of your community? Or do you just take and demand more? Where’s the gratitude for the incredible bounty and goodwill you and your community continue to be on the receiving end of? Perhaps your sense of entitlement prevents you from feeling and expressing gratitude. I have no idea who you are or who you think you are but you have a terrible attitude and I don’t like it. With an attitude like yours, don’t expect to be winning friends and influencing people, much less getting anyone to open their wallet for you. My wallet is empty, by the way, but I give what I can, when I can. I happen to agree with you on the issue of white privilege and, yes, my skin is white. That does not mean that I’ve had an easy life, quite the contrary, I assure you. But the difficulties I’ve endured in my life, beginning with childhood, have resulted in my being very compassionate.